In October last year, on Day 218, I posted this picture of kale from our garden. On that day I talked about happiness. 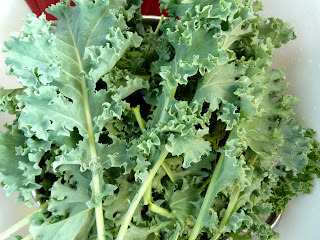 And I lamented: But being happy when my husband wants me to eat some freshly picked-from-the-garden kale? I'm trying to be happy on that one, but I'm not sure I can get there. Obviously my ideas about kale have changed. As I was picking kale this morning I kept talking to myself about how good the kale looked. Even when I brought it in, I kept talking about how good it was. Go figure! Sure is gonna be tasty in my juice tomorrow morning.